Ian established Learn-to-Fly.co.uk as an independent flying school in 2002. Ian has been flying hang gliders and microlights since 1987. In 1992 he started flying light aircraft and went to America to obtain his commercial pilot's license (CPL), where he became type rated on twin engine aircraft and seemed destined for a career as an airline pilot! However, adventure got the better of him and he went to Africa in 1993 to establish Batoka Sky, the microlighting company that offers pleasure flights over the Victoria Falls. The company is still going strong to this day! Ian returned from Zambia in 1996 to experiment with more conventional lines of work whilst remaining an active hang glider and microlight pilot. In 2002 Ian went to Portugal to gain his Assistant Flying Instructor rating with Gerry Breen at the Algarve Sports Centre and ever since he has been a licensed flying instructor. 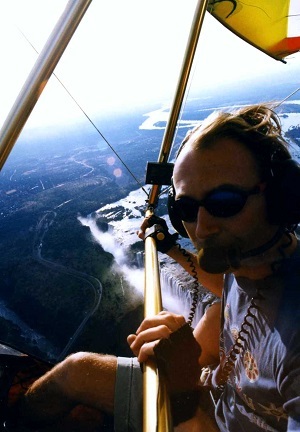 In 2005 he uprated to a full FI and moved the flying school to Damyns Hall airfield in Essex and operated there for 7 years flying hundreds of people both in microlights and in his tandem hang glidier. In 2014 Ian relocated Learn to Fly to the South West after a transitional period and the school has blossomed at Henstridge airfirled which has a tarmac runway and great hangar space for Ian to build and maintain his fleet of microlights. He has been a member of the Park Gliding club at Mere anbd has twice flown to Greece to visit friends by microlight. In late 2018 he purchased P&M's PulsR, the first fully composte flex wing microlight in the world and hsi intention is to focus on aircraft sales and long distance tour and train flying utlizing airfields in France Italy and Greece. Over 30 years flying experience! 7 days a week, most weekends included, subject to weather and by appointment. Committed to helping you get your license in a time frame to suit you. All year round, 7 days a week, subject to good flying weather and holidays. Normally we take 4-6 weeks off in the winter!! We often fly until sunset! Henstridge planning regs require last take off flights before 7pm. Most Weekends and Bank Holidays included!